Season five stars Taylor Schilling, Natasha Lyonne, Uzo Aduba, Dascha Polanco, Nick Sandow, Kate Mulgrew, Laura Prepon, Danielle Brooks, Jackie Cruz, Lea DeLaria, Jessica Pimentel, and Selenis Leyva. The series is written and executive produced by Jenji Kohan, based on the book by Piper Kerman. 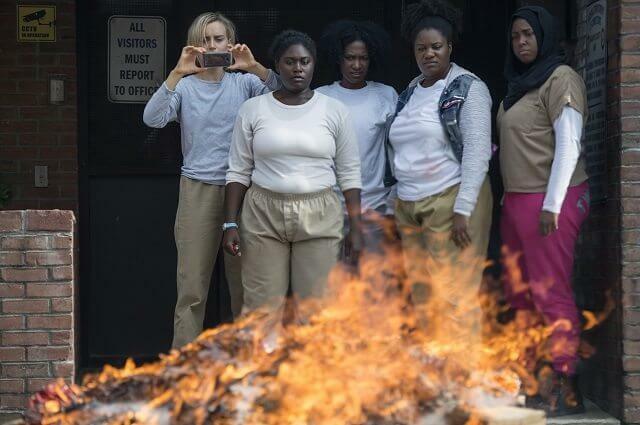 The Season 5 Plot: A riot sparked by Poussey’s death quickly escalates when the inmates gain control of the prison. Once they get a taste of power, chaos ensues through the halls of Litchfield. In real time and over the course of just three days, season five of Orange Is The New Black will leave the inmates’ lives forever changed as they are emboldened to fight for redemption, resolution and the respect they deserve.